A long-banned pesticide remains in the Great Lakes environment but is on the decline, scientists say. Toxaphene was a heavily used pesticide in the U.S. until people realized how toxic it was in 1982, the year it was banned in the Great Lakes region and most other places. It was banned nationally by 1990. Toxaphene mostly came to the Great Lakes on winds from the South where it was used heavily in agriculture. The pesticide breaks down slowly and accumulates in the fatty tissues of fish and other wildlife, so it’s remained in the Great Lakes long afterwards. However, slowly but surely, the contaminants are going away. 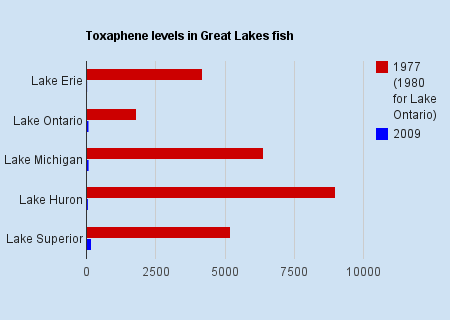 Researchers examined toxaphene in the Great Lakes and found that between the mid-1970s and the mid-90s, concentrations in fish decreased rapidly. Since the mid-90s decreases have been slower, but the downward trend continues. The study is in press at the Journal of Great Lakes Research. Researchers analyzed lake trout from every lake except Erie, where they used walleye, to determine toxaphene levels. Concentrations were highest in Lake Superior and lowest in Lake Erie. Lake Superior has always had the highest concentrations. “Lake Superior is bigger and colder, so when toxaphene came to the Great Lakes through the air, it was attracted to the lake,” said Thomas Holsen, professor of civil and environmental engineering at Clarkston University and co-author of the study. While its size gives toxaphene a larger target, the cold water doesn’t release the chemicals as gases very quickly. Holsen said toxaphene “cycles around the globe” so now that the Great Lakes are purging the chemicals, they’re heading elsewhere. “In the Great Lakes, the out arrow is bigger than the in arrow right now,” Holsen said. But since the chemicals are world travelers, those arrows can change direction quickly. As Echo reported, after the official ban in 1990, the lake’s toxaphene levels continued to rise for a few years. But, even in the biggest, coldest and deepest lake, the overall trend has been positive. From 1990 to 2009, toxaphene levels in Lake Superior’s lake trout have decreased approximately 86 percent. There are no legal uses of toxaphene in the world, according to Holsen. Eventually, the chemicals will break down. Toxaphene can damage people’s nervous system, livers, kidneys and cause death, according to the Agency for Toxic Substances and Disease Registry. Animal studies have also proved it cancerous. People can be exposed by breathing it in, touching it or drinking contaminated water. But most people are exposed by eating fish. A recent analysis of Great Lakes fish advisories recommended that contaminants like toxaphene be added to advisories. All Great Lakes states have fish consumption advisories, but not all test for toxaphene. There are a few labs in the region that test for it. Wisconsin does not, said Candy Schrank, aquatic toxicologist with the Wisconsin Department of Natural Resources. Toxaphene is difficult to test because it’s a mix of more than 670 chemicals. Michigan tests for toxaphene in Great Lakes waters, said Joeseph Bohr, aquatic biologist with the Michigan Department of Environmental Quality. But it’s not a major concern. “It’s included in our standard testing,” Bohr said. “But it doesn’t meet the criteria to ever issue consumption advisories. 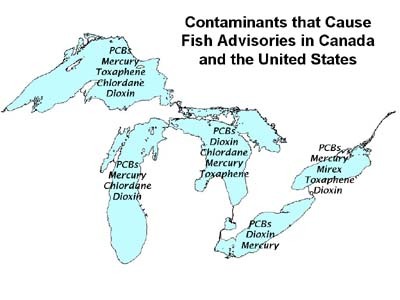 Bohr said mercury and PCBs are what almost always drive the fish consumption warnings in Michigan. Toxaphene testing has been considered by the Great Lakes Fish Consumption Advisory Consortium, a group of officials from all eight Great Lakes states. Nothing has been finalized in those talks, according to Pat McCann, fish advisory program manager with the Minnesota Department of Health. A review of all of the states’ fish consumption advisories by a research department at Cornell University prompted the authors to suggest potentially adding some contaminants, like toxaphene, to advisories. McCann said a consortium-wide advisory on toxaphene is unlikely since it’s mostly an issue now in Lake Superior. Although more slowly in Lake Superior, the harmful chemicals seem to be fading from the Great Lakes environment, perhaps becoming a greater problem elsewhere for a while. We're a project of the Knight Center for Environmental Journalism at Michigan State University. 31 years after the last application of Toxaphene in the Great Lakes it is still there and it is still there in fish tissue. The EPA wrote a paper in 1999 that said Toxaphene would dissipate in 10 to 14 years (the paper written 9 years after the ban). 1,000,000 pounds of Rotenone containing 10% Toxaphen was dumped in Strawberry Reservoir in 1990 and recently the Department of Human Health and Services Epidemology Department found it was still present in Alpha BHC forms in fish tissue. I will reseach how many hundreds of thousands of Toxaphene were applied, but if 1,000,000 was applied to a lake of 56 sq miles,……you can imagine how much was put into the Great Lakes. It is a toxin. It impacts the nervous system. If inhaled it is lethal. 9-13-1999 EPS Bulletin Toxaphene. Mutagenicity–Changes in human genetic material have been noted in workers exposed to toxaphene. There are also numerous positive mutagenicity assays of toxaphene: the Ames test, sister chromatid exchange, chromosomal aberrations in toxaphene- exposed humans, and forward mutation assays. The implications of this for human germ cells are not known. One assay designed to assess the dominant lethal effects on implantations in mice yielded negative results. Some data suggest that the polar fraction of toxaphene may be more mutagenic than the nonpolar fraction. Carcinogenicity–Toxaphene is classified as a probable human carcinogen (Group B2) by EPA based on oral studies in animals. No conclusive human epidemiological studies are available for toxaphene. Oral administration of toxaphene resulted in an increased incidence of hepatocellular carcinomas and neoplastic nodules in mice and thyroid tumors in rats. Toxaphene has recently been observed to have estrogenic effects on human breast cancer estrogen- sensitive cells. Xenoestrogens have been hypothesized to have a role in human breast cancer. In addition to potential carcinogenic effects, toxaphene may also cause disruption of the endocrine system due to its estrogenic activity. It would seem that a more likely explanation of the higher initial concentrations of toxaphene would be due to prevailing wind patterns. Where was toxaphene use more prevalent, and how might that impact where it was transported? Airborne deposition of toxics is obviously a complex issue, but the mere size of a receiving area should have little or no impact upon concentrations. East Lansing, Michigan, is gathering information about lead contamination in resident water services. Notices regarding the potential threat were issued in November.